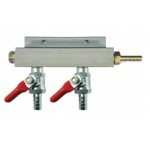 Air manifold with 2 separate shut offs made of extruded aluminum. 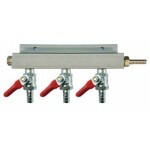 ..
Air manifold with 3 separate shut offs made of extruded aluminum. 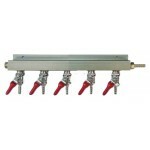 ..
Air manifold with 4 separate shut offs made of extruded aluminum. 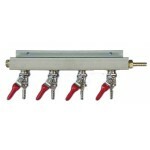 ..
Air manifold with 5 separate shut offs made of extruded aluminum. ..
Shuts off air flow to the coupler. .. 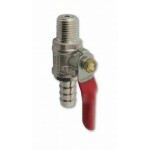 This FOB manufactured by Pacific Equipment is a durable plastic beer foam control device for be..